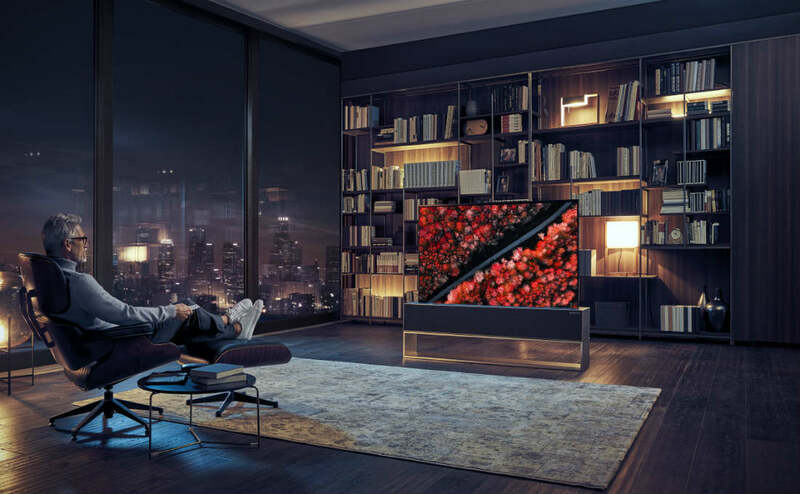 The new LG SIGNATURE OLED TV R features its Alpha 9 intelligent processor and a flexible screen that allows the TV to roll up and back with a touch of a button. The LG SIGNATURE OLED TV R includes Apple AirPlay2 and HomeKit support, as well as voice control capabilities via Amazon Alexa. 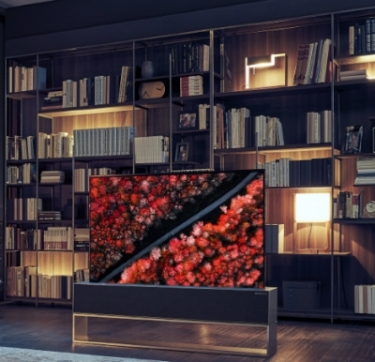 LG Electronics is looking to begin CES 2019 with a bang by introducing its new rollable OLED TV, the LG SIGNATURE OLED TV R (model 65R9). The TV uses a flexible screen technology that allows the screen to roll up and roll back out when needed at the touch of a button. Using the flexibility of an OLED panel made of organic materials, the LG SIGNATURE OLED TV R can transform itself to offer three different viewing options: Full View, Line View, and Zero View. Full View delivers a large-screen viewing experience and makes use of LG's second-generation α (Alpha) 9 intelligent processor and deep learning algorithms. Users can use their own voice to get things done with Amazon Alexa, a new addition to LG’s AI TV lineup in 2019, and the support of Apple AirPlay 2 and HomeKit. With AirPlay 2, users can play videos directly from their Apple devices, iTunes and other video apps. Apple HomeKit support gives consumers the ability to control their LG TV using the Home app or by asking Siri. Line View allows the TV to be partially unrolled, allowing for management of specific tasks that do not require the full TV screen. In Line View, users can choose from features such as Clock mode to check the time and weather, Frame mode to enjoy family photos shared from a smartphone, Mood mode to create a more relaxing atmosphere, as well as others including Music and Home Dashboard. When in Zero View, all 65 inches of the TV are hidden from view and tucked away in the base. Users can enjoy music and other audio content from the TV's 4.2-channel, 100W front-firing Dolby Atmos audio system. In Zero View mode, users can still use the full range of listening options available. The SIGNATURE OELD TV R features a brushed aluminum casing and a wool speaker cover designed by Kvadrat of Denmark. LG will have the TV available for viewing at its booth (LVCC Central Hall #11100) throughout CES 2019. What is the purpose of the open rectangle below the box that holds the rollable television screen, speakers, etc.? Seems like it will be difficult to hide the typical wires and cables (which of course they do not show you in a display model…).